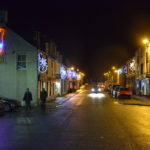 Everyone is invited to a carol service with a difference in Lochgilphead. The charity Marie Curie, which offers care and support through terminal illness, will host a ‘Lights to Remember’ carol service at Mid Argyll Hospital on Wednesday December 5. The service in the hospital foyer will allow people to come together to remember loved ones. Messages can be written on tags to hang on a Christmas tree of remembrance. To add festive magic, the Christmas tree lights will be ceremonially switched on during the service. The service, organised by the Mid Argyll fundraising group for Marie Curie, starts at 7pm.